Thank you, Council of the Great City Schools! As part of its nationwide initiative to provide high-quality mathematics curriculum for English Learners in middle school, Ready Mathematics 6–8 ©2020 is available to all members of the Council of the Great City Schools (CGCS). Encourages students to develop a deeper understanding of mathematics concepts through the embedded Standards for Mathematical Practice. Builds on students’ prior knowledge with lessons that make connections within and across grade levels and directly address the major focus of the grade. English Language Development guidelines on scaffolding language use during instruction to benefit students at different levels of English proficiency. Language routines that integrate language and mathematics. Concept development activities that allow students of varying mathematical and English language abilities to build on familiar concepts. Ready Mathematics can be used as your core curriculum or to enhance your mathematics instruction. Designed to develop strong mathematical thinkers, our programs focus on conceptual understanding using real-world problem solving and help students become active participants in their own learning. Ready Mathematics can be implemented with i‑Ready to provide a fully integrated blended learning program. 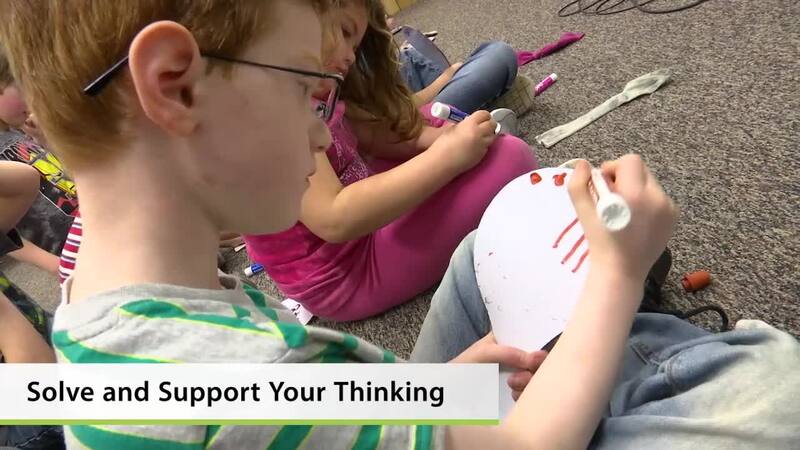 See how students collaborate and share problem-solving strategies with the Think–Share–Compare Routine. Ready Mathematics is supportive of both teachers and students through rigorous instruction and practice books that build students’ skills and confidence, and teacher materials that empower teachers through supportive guidance and teaching tips. The two-part student edition consists of a Student Instruction Book and a Practice and Problem Solving book, a powerful combination of thoughtful instruction, real-world problem solving, and fluency practice. The Teacher Resource Book features embedded, point-of-use professional support in every lesson, such as learning progressions, prerequisite skills, and prompts for promoting mathematical discourse. Robust formative and summative assessment tools closely match the rigor and expectations of the state assessments and include lessons, mid- and end-of-unit assessments, and performance tasks at the end of each unit (Grades 2–5 only). Differentiating instruction is made easier with access to Ready Teacher Toolbox, an online teacher support tool that equips teachers with the full range of K–8 instructional resources, regardless of what grade they teach, for students performing below, on, or above grade level. Ready Mathematics 6–8 ©2020 includes enhanced features that support English Language Learners by providing integrated math language routines, suggestions for scaffolding language use in math instruction, and a full guide on how to introduce the teacher-led discourse-driven instructional routine. Differentiating instruction is made easier with access to Ready Teacher Toolbox, an online teacher support tool that equips teachers with the full range of K–8 instructional resources, regardless of what grade they teach, for students performing on, below, or above grade level. Ready Mathematics was built to reflect the connection between the latest research and practical classroom application. Guidance from our program’s authors continues to shape Ready to ensure that it is rigorous for students yet easy to implement for teachers. Check out their whitepapers and our discourse cards below for practical advice, tips, and tools. Discover strategies that support student collaboration and mathematical discussion. Know more about the strategies to facilitate productive mathematics discussions. Read how to implement the discourse that encourages instructional routines in the classroom. Use these cards to facilitate and support the organic discussions within class.